WASHINGTON (Reuters) - The U.S. Federal Aviation Administration (FAA) will this week hold a meeting with major U.S. airlines that fly the currently grounded Boeing 737 MAX aircraft and three major pilots' unions, the agency confirmed on Thursday. Boeing Chief Executive Dennis Muilenburg said on Thursday that the software update is working, with about two-thirds of the fast-selling jetliner's customers having seen the fix in simulator sessions. The FAA said the meeting is to help "the FAA to gather facts, information, and individual views to further understand their views as FAA decides what needs to be done before returning the aircraft to service." 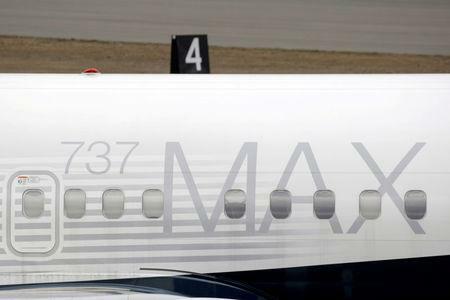 The agency "continues to gather all available information and data in considering the return of the 737 MAX to service," it added. Dennis Tajer, spokesman for the Allied Pilots Association that represents pilots at American Airlines, said he expected the union would be able to "provide feedback and input regarding pilot training related to the 737 MAX." Federal prosecutors aided by the FBI, the Department of Transportation's inspector general’s office and a blue-ribbon panel, are also reviewing the 737 MAX’s certification and other issues surrounding the aircraft. U.S. lawmakers and the National Transportation Safety Board are conducting their own reviews of the FAA's certification process, which delegates some tasks to the manufacturers.